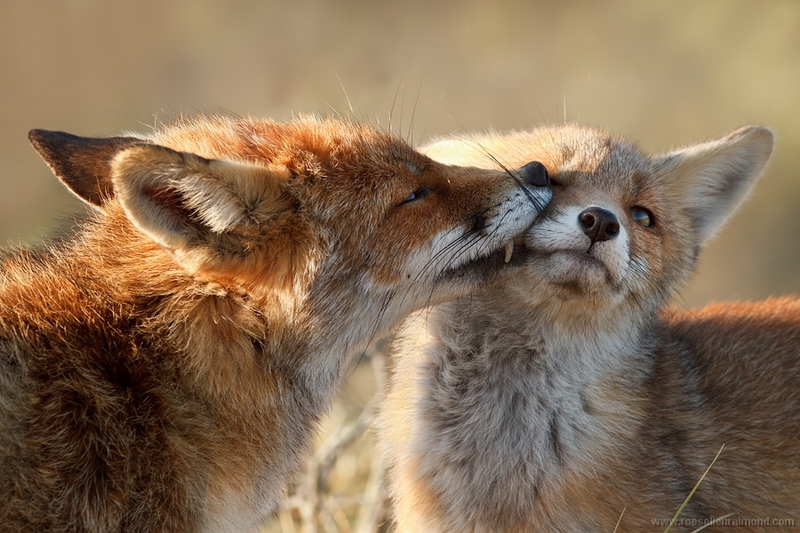 Foxes have been notorious for decades, consistently put down as a symbol of trickery and deceit. 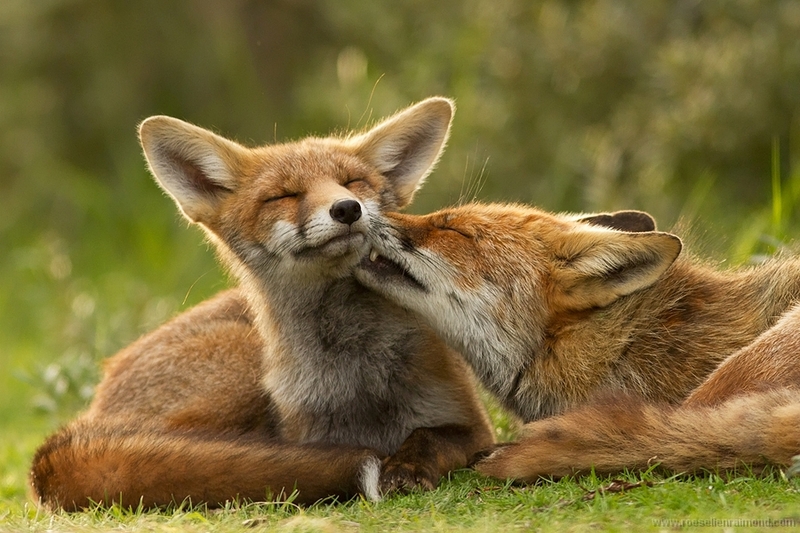 Many of us are raised with fairy tales about this so called sly and ferocious animal and it payed off: Even I was made to believe that foxes are scary and dangerous creatures. For a little mouse they must be the most frightening thing in the world, but I’ve never ever seen a fox showing any aggressive behaviour towards humans. I acknowledge that finding your beloved chickens being reduced to a bunch of feathers must be an awful experience. And a fox definitely isn’t going to contribute to a larger wading bird population either. But hey, a fox has to eat, just like we do. Compare the damage done by foxes to the mess we’re making as a species and think again…. Plus: we do have a choice how we treat our environment, while a fox is simply doing what he’s programmed to do. Nothing more, nothing less. That’s what’s called nature. Anyway, I was lucky to be able to closely witness fox behaviour and judge for myself. 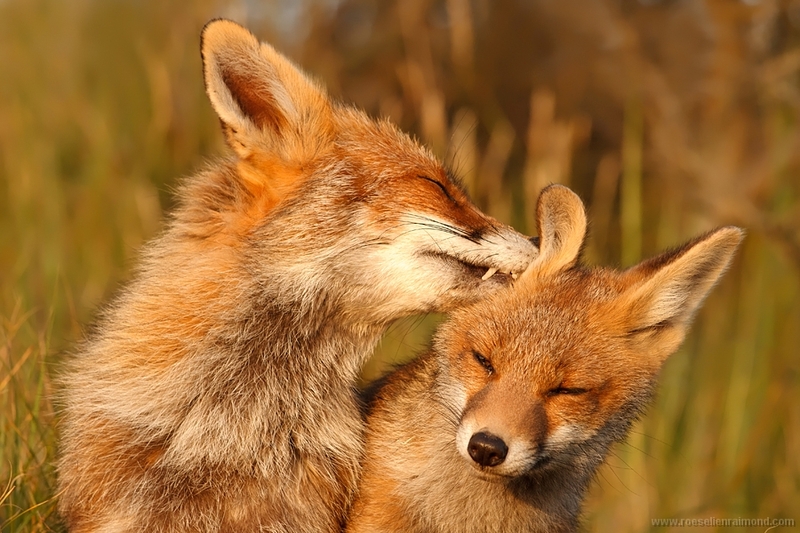 Foxes are often seen alone and therefore they were thought to be solitary animals. 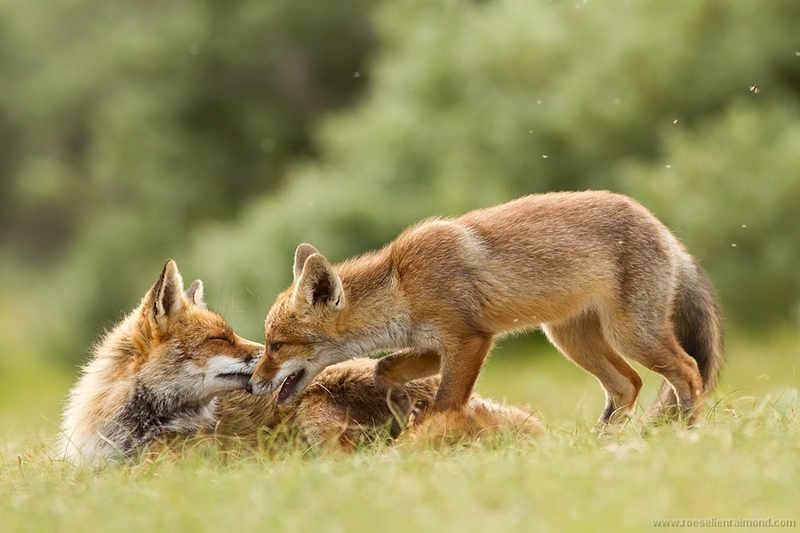 But especially in (sub)urban regions, with high food availability, foxes tend to live in social groups. They hunt alone, but live together. 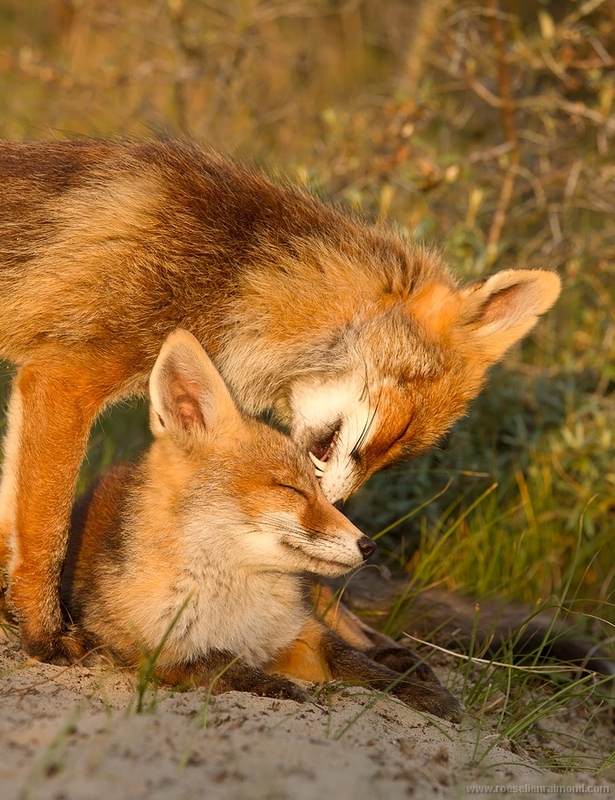 Foxes live in a family group, led by a mated pair. Au contrary beliefs male and female don’t just meet during mating season. Rumours go they bond for life….as a happily married and even monogamous couple. While the vixen is pregnant, the dog fox takes care for her food. 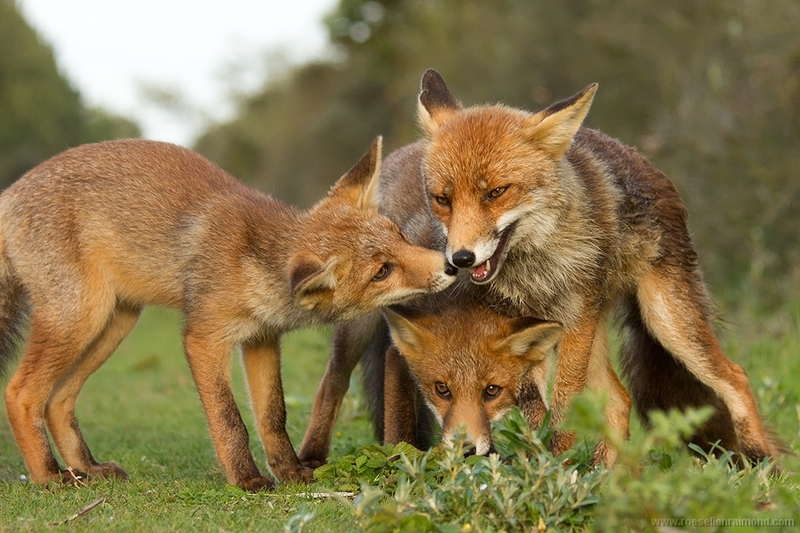 Especially in urban areas, female foxes from a previous litter often stay part of the group to help mum raise and provise the new kits. 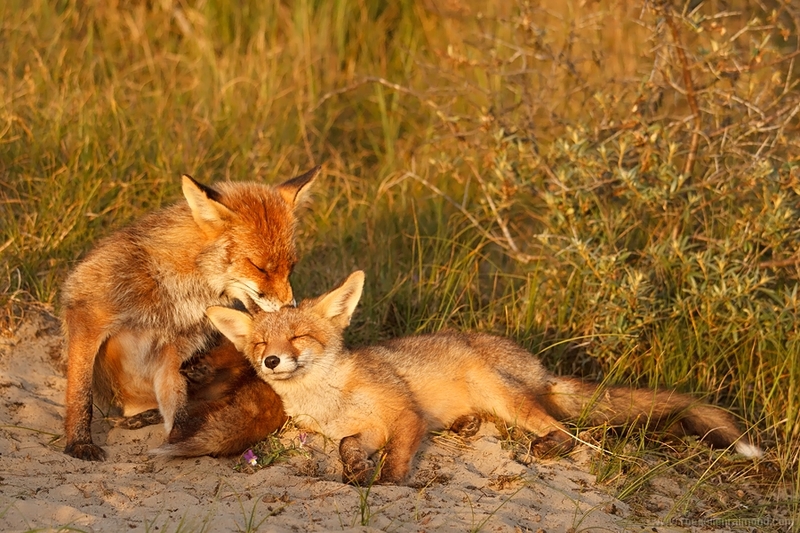 These subordinate foxes, so called ‘helpers’ forfeit their right to offspring that year. 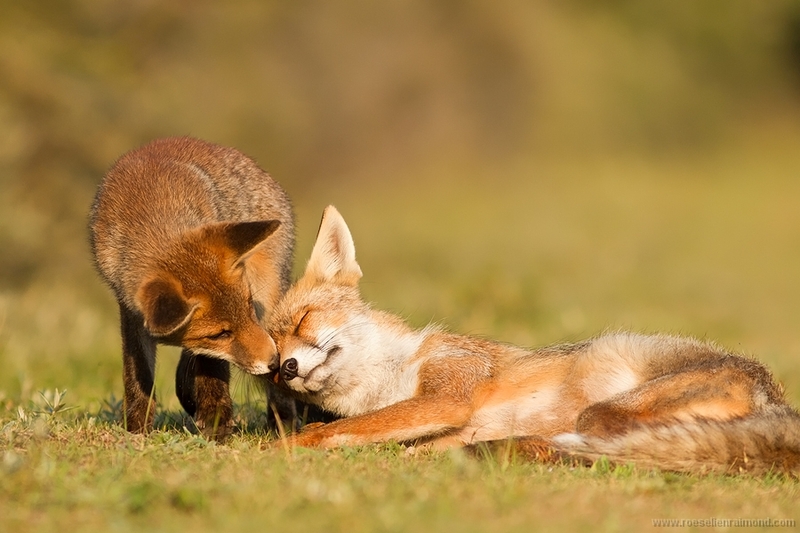 Instead, they teach their new brothers and sisters everything a fox should know. They show them how to hunt, play, fight and grow up to be strong and healthy hunters. And of course this baby-sitting includes a lot of cleaning, hugging and caring. 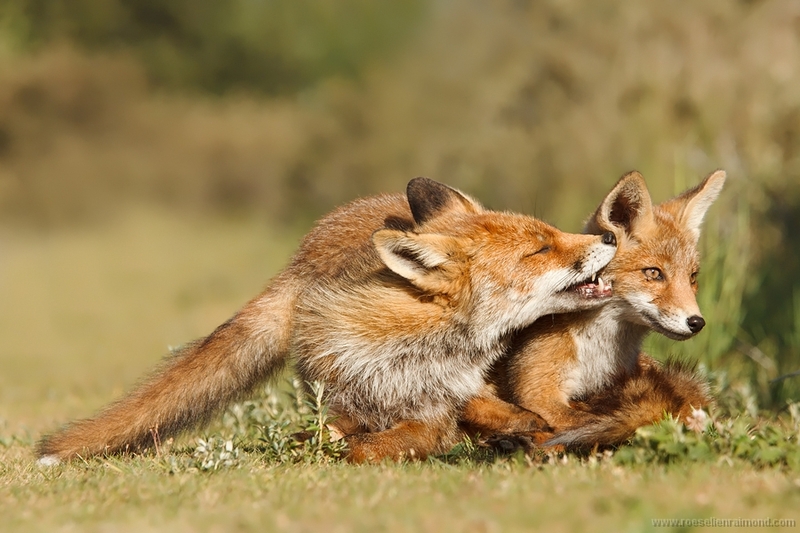 This grooming is an important aspect in fox relationships, which in all probability contributes to better bonding. Both mother and helpers often lay down with the kits for a good old cleaning session. The kits are thoroughly washed, un-ticked and hugged. As expected, these numerous attentions aren’t always appreciated by the kits. They have more important things to do, like going out to explore this brand new and exciting world. So far this little theory…..take a peek inside fox family life. And I know….this might be 100% projection, but doesn’t it look like the kits are smiling while pampered by mum? 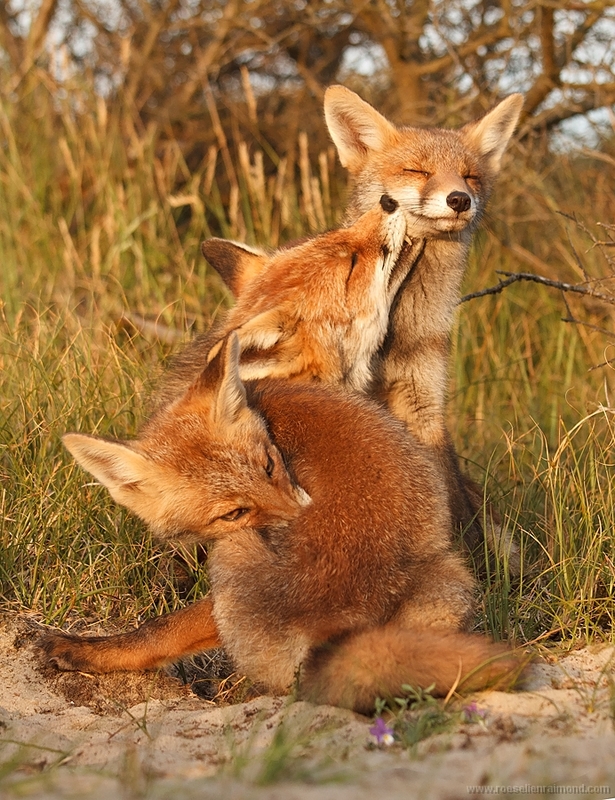 Grooming is an important aspect in fox relationships, which in all probability contributes to better bonding. 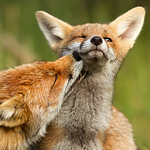 Fox kit thorougly cleaned by mum. 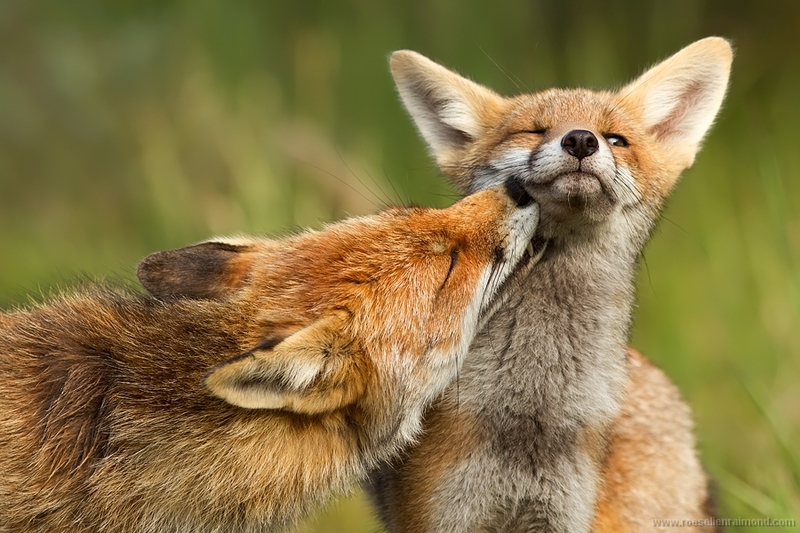 They don’t always seem to like all this affection..
It’s nice to learn more about foxes. Thank you for posting this information. What beautiful photographs! I find it interesting how wolves and foxes have the same negative images attached to them through myths and stories. The snow is a WordPress thing.